Not only is the above comment concerning Todd Friel and his ministry a complete fabrication, the majority of the 71 comments that follow are equally vacuous and frankly ,really embarrassing in terms of intellectual honesty. They mostly attack Todd Friel from the foot of a vary large straw man that is sure that the questions are direct challenges to the professed salvation of the Christian to whom they are addressed. I believe all three to be very reasonable questions for a couple of reasons. First of all, not everyone who ‘professes’ Christ ‘possesses’ Christ. The preciousness of Christ to the professing Christian is an indicator of the depth of his or her faith . Spending time in personal Bible reading and study also indicates the depth of one’s faith, as well as being a genuine disciple who wants to learn from his/her master teacher. None of the above questions would bother me. In fact, I would welcome them as opportunities to share with another believer what I believe and why I believe it, and at the same time grow closer to a brother. On the other hand, if I didn’t know what being ‘born again’ really meant, realized that Jesus wasn’t really very precious to me, or I rarely spent time alone with my Bible I would be offended, much like many of the commenters at the original blog at SSB. Also I can envision asking all three questions from a heart burdened with the knowledge that many, many young people these days are coming to Christ for all of the wrong reasons and have been deceived into believing they are saved when they are far from it. They come to Christ because of the ‘worldly attractiveness’ of a local ‘seeker friendly’ church, from ‘’preachers in torn blue jeans and t-shirts to ‘worship ‘ that more closely resembles a rock concert , to being sold a bill of goods promising their ‘best life now’ or achieving their special purpose and/or ‘dream destiny’. So yes, asking intuitive questions of a professing Christian is not necessarily bad, and in fact serves a couple of really good purposes, none of which are directly ‘challenging’ someone’s claim to be a Christian. I only wish I had been able to comment at SSB. I seem to have been banned from SSB for quite some time, after I posted favorable comments concerning things I am supposed to dislike (Calvinism, John MacArthur, complementarianism, and a few others). At least I don’t get a ‘Comment’ option when I visit, which is actually rarely. It’s only because something from SSB popped up in my inbox that I ended up there early this morning. At any rate, I did take the opportunity to answer the question about Todd Friel’s questions, just not at SSB (what spirit? ), but here at The Battle Cry. This entry was posted in Discernment, Salvation. Bookmark the permalink. Dan, I like the way you think about these things, and what you’ve written in this post. Not knowing Mr Friel, I cannot comment about him directly. But the graphic concerns me. The questions are confusing at best. It’s one thing to discuss points like these as part of a face-to-face conversation. It’s quite another when they show up as a visual “sound bite” for the unwary. 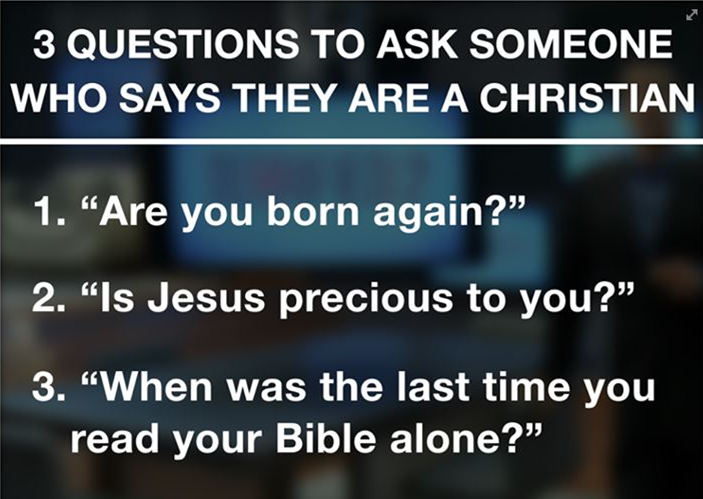 There are plenty of apostate forms of Christianity that claim “born again status” for their adherents. People in such false gospels will say they are “born again” and mean it. There are many false Jesuses around too. The real one told us, “Many will say to me Lord, Lord”. Those people will seem amazed that they were following a false Christ. So this question too is misleading and unhelpful. The third is outright legalistic, looking to conformity to man-made rules to indicate a person’s relationship to God. And where are the two physical actions that Jesus explicitly commanded his followers to perform until his return? Nowhere here. As the apostasy spreads, it’s so important that discern the real thing from the almost-real fakes. Here are 20 questions to identify some apostate pastors. Would love to hear any thoughts you might have. I know enough about Todd Friel to say that his questions would not be coming from having judged anyone’s profession. His context has a lot to do with witnessing and helping those who have fears in that area. iIt’s also highly that some would profess Christ, lying to just get away. In that case they provide an opportunity to either continue a discussion with someone who needs the gospel message, or simply to bond a bit with a believer. I’ll need to check out the link you sent!